While watching A&E’s adaptation of Pride & Prejudicewith my wife this week, I was struck by the above exchange between two of the story’s main characters. 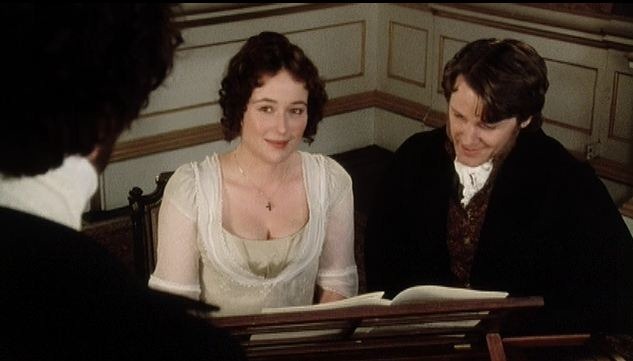 When Mr. Darcy seeks to excuse his lack of people skills as a lack of talent, Elizabeth Benet cuttingly replies that talent is a result of practice. In other words: If you don’t like where you are, work on it. Talent isn’t a state of being, but rather something acquired through continual effort. Part of the reason it struck me the way it did was because of a similar exchange I’d had with a friend several years ago (again with a piano as the backdrop). After listening to him rather skillfully play the instrument for several minutes, I remarked on how much I wished I could play that well. He told me that the truth was if I really wanted to play as well as him, I’d be learning how. And he was right, the little smart-aleck. My last piano lesson had been at least five years ago and, while I occasionally toyed with the instrument, I never gave it any serious attention. I wanted the talent without all that tedious hard work. But that’s not the way it works. That’s not the way it has ever, in the whole history of the universe, worked. While some people may find themselves blessed with more of certain talents than others, any ability—be it Elizabeth Benet’s piano playing or Mr. Darcy’s people skills—requires continual effort to maintain and improve. It doesn’t just…happen. As you many have rightly guessed by now, the purpose of this Sabbath Thought is not primarily to cross-examine nineteenth-century novels or discuss the proper techniques of advanced piano-playing. Rather, every example thus far entertained has been to reinforce one singular point of Christian living: improvement requires work. So many of us are so eager to wish ourselves to a more accomplished state of discipleship that we forget what it takes to get there—or worse, we convince ourselves that we simply “have not the talent which some people possess,” and throw in the towel on ever developing in the areas in which a Christian ought. It’s so much easier to say to ourselves (and others! ), “I’m just no good at _____” and be done with it. The real challenge is admitting, “I really need to work on _____” and then following through. The best way to get better at playing the piano is by spending time playing the piano. In the same way, the best way to get better at Bible study is to spend time studying the Bible. The best way to get better at praying is to spend time praying. There is a definite pattern here, and I don’t think it is overly difficult to discern. Christ gave to His disciples a parable concerning preparing for the Kingdom. In Matthew 25:14, a man sets out on a journey to a far country, but not before delivering some of his money (here referred to as “talents”) to his servants with the expectation that they “do business” (Luke 19:13) until his return. Upon his return, the man finds that two of his servants have been busy—in his absence, they used what they had been given and doubled what their master had entrusted to them (Matthew 25:20, 22). They meet with the praise and approval of their returning master, being rewarded with rulership “over many things” (Matthew 25:21, 23). The last servant took a different approach. Rather than improve what he had been given, he admits to his master, “I was afraid, and went and hid your talent in the ground. Look, there you have what is yours” (Matthew 25:25). This servant met with a less favorable outcome than his fellows. Denounced by his master as “wicked and lazy,” he is cast into outer darkness and destroyed (Matthew 25:26, 30). Because he was afraid to do anything with what had been entrusted to him—which was his master’s expectation—he loses everything. The difference between the first two servants and the unfortunate third was a matter of initiative. The first two saw that they’d been given something valuable, knew they were expected to do something with it, and did. The third saw and knew the same things, but opted instead to bury his stewardship in the ground. The master in this parable expected his servants to change the status quo, not preserve it. Our Master likewise expects us to take what He has given us and work toward changing. It’s far too easy to tell ourselves that we simply don’t have the ability to excel in a certain area of Christian living. It’s far too easy to take our talent and fearfully bury it in the ground. Don’t. Don’t sell yourself short. God committed this calling to you because He knows you can live up to it. He doesn’t leave us to do it on our own; in fact, He promises to guide us through every step of the way (Hebrews 13:5). But you cannotallow yourself to believe that it’s okay to not be okay in the areas He expects you to grow in. It is not acceptable for a Christian to grow complacent and stagnant—we must always “press toward the goal for the prize of the upward call of God in Christ Jesus” (Philippians 3:14). If your approach until now has been to look at the areas of Christianity in which you are lacking and write them off as unachievable, to tell yourself that you “have not the talent which some people possess,” then it’s not too late to change. Dig your talent back up from wherever you buried it, and start seeking, with God’s guidance, to improve in the areas where you fall short. There will never come a day in this life when you find yourself having mastered every aspect of Christianity. If you already excelled at every facet of your calling, there would be little purpose in your presence here on Earth. The calling of a Christian is one of continual striving for improvement—of wrestling with our weaknesses using the strength of God, rooting them out of our lives and replacing them with our Creator’s righteous character. What God wants to find—what God expects to find when He brings His Kingdom to the earth—are disciples who have not shied away from improvement, who instead have thrown themselves continually at the task of growing in Godly character. They will not be perfect, nor will He expect them to be—but they will be trying. They will be practicing the piano, not just wishing themselves good at playing it. 3 Responses to "on Pride and Prejudice and Pianos"
Jeremy, the exchange you had with your friend easily mirrors exchanges I’ve had with my trumpet teacher when I haven’t put in the practice I should. Making excuses instead of putting in more effort is so easy. Thank you for this reminder.